Monday July 8 1911 Did not come home till 6.30. Did very little work and slept all I could. Weather very warm. Rob Cora Otto & Blanche here in the evening a while. Tuesday July 4 1911 Did some baking. Went down home at 11.15 and Will came an hour later. Blanche & Otto went home to Des Moines in the afternoon. I wrote letters in the afternoon. In the evening Hattie went down to see Williams fire works. Mother had rather a comfortable day. 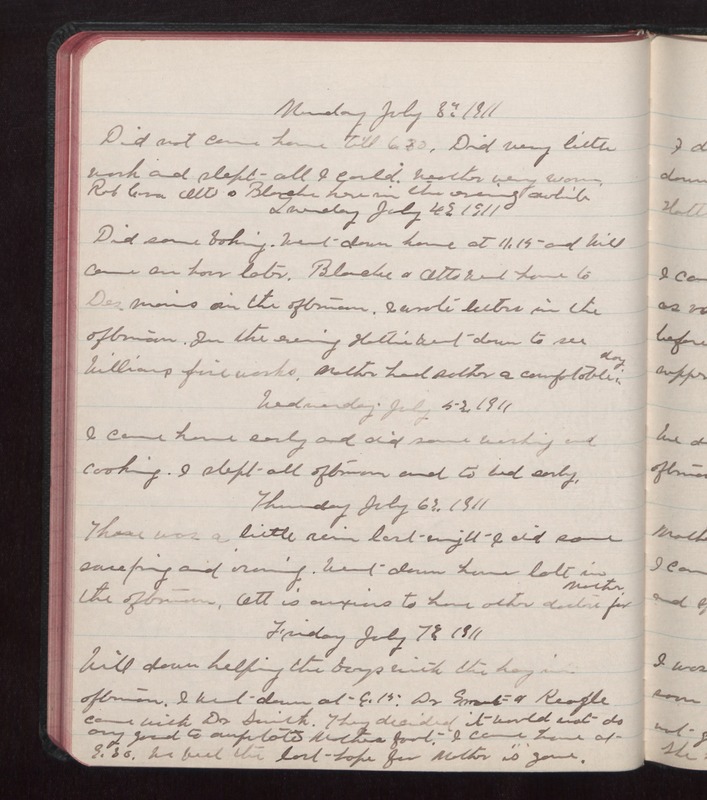 Wednesday July 5 1911 I came home early and did some washing and cooking. I slept all afternoon and to bed early. Thursday July 6 1911 There was a little rain last night I did some sweeping and ironing. Went down home late in the afternoon. Ott is anxious to have other doctors for Mother. Friday July 7 1911 Will down helping the boys with the hay in afternoon. I went down at 6.15. Dr [Grant?] & [Keogle?] came with Dr Smith. They decided it would not do any good to amputate Mothers foot. I came home at 9.30. We feel the last home for Mother is gone.